February 3, 2019 at 8:48 pm. 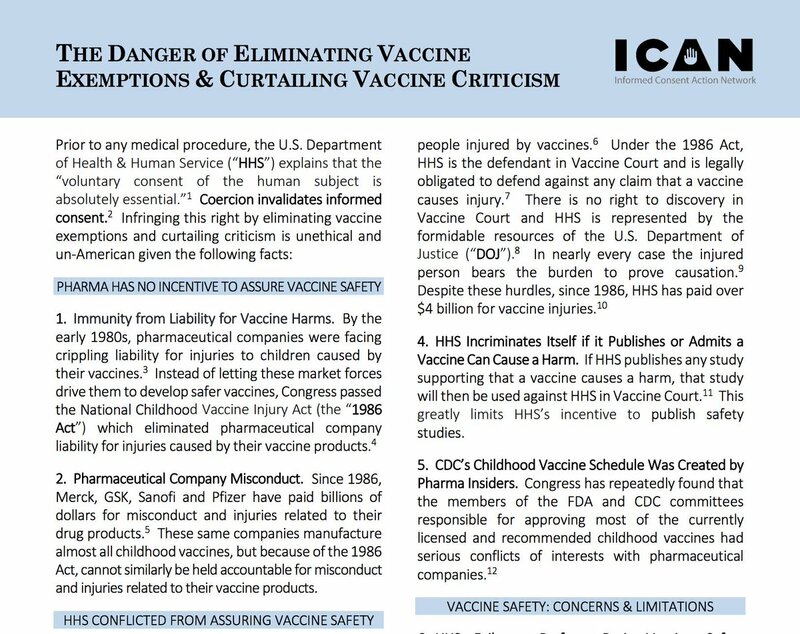 Throughout recent history, a handful of high-water marks have threatened to expose the falsehood of the vaccine industry’s ‘safe and effective’ narrative. Two days after receiving five vaccines at once, 19 month-old Hannah Poling began her regression into her eventual autism spectrum disorder diagnosis. Hannah’s case eventually became part of over 5,000 cases in the now historic Autism Omnibus Proceedings (OAP) in 2007. Rather than try over 5,000 cases, the plaintiffs and vaccine court Special Masters choose six test cases to represent all the families who claimed vaccines caused their child’s autism. Originally deemed a test case to set a vaccine court precedent that vaccines could contribute to the onset of autism spectrum disorder, Hannah’s case didn’t go how the Department of Justice (DOJ) attorneys had originally hoped. Expert witness in the OAP cases, Dr. Andrew Zimmerman, gave his professional opinion that vaccines can lead to autism in a certain subset of children, which included Hannah, with an underlying mitochondrial disorder. His testimony triggered a panic at the U.S. Centers for Disease Control and Prevention (CDC), the DOJ and corporate media outlets. It led to a quick twenty-million-dollar settlement with the Polings in 2010 but not before Hannah’s story became worldwide news. In 2014 CDC senior scientist-turned-whistleblower William Thompson admitted that he and his co-authors committed scientific fraud on a seminal study investigating a link between the MMR vaccine and autism. Once again the corporate media and pharmaceutically-influenced medical community went into damage control to obscure the story. There now exists direct testimony, under oath and uncensored for anyone to watch spotlighting many inconvenient facts about vaccines. Thanks to a custody court case in Michigan, the public can now hear the admissions of the 86-year-old vaccine luminary Dr. Stanley Plotkin who volunteered to serve as an expert witness in the case. Who is Dr. Plotkin? In a 2013 poll of the Top 50 “most influential people in vaccines,” Dr. Plotkin was voted number two, behind only Bill Gates. Gates calls Plotkin’s book Vaccines “a bible for vaccinologists” to which Plotkin, a self-proclaimed atheist, publicly boasted “I hope it is more accurate than the bible.” He has also served as a consultant and directly developer on several vaccines currently recommended by the CDC. While popular pro-vaccine zealots and vaccine risk deniers have locked arms in their refusal to publicly debate the many issues underlying current vaccine schedules, Dr. Plotkin’s 9-hour testimony now serves as perhaps the most damning admissions against the purported ‘settled science’ of vaccines, their safety and some of their most troubling ingredients. Widely shared and talked about on social media, Dr. Plotkins testimony has been the running focus on Del Bigtree’s show The HighWire in a weekly segment called Plotkin On Vaccines. The topic of fetal cell lines used in vaccines has been a hot button topic for both the public and lawmakers. Citing religious objections, many refuse vaccine products on the grounds that aborted fetuses and their cell lines we used in both the experiments to create vaccines and as a part of the vaccine ingredients. In an ironic twist of fate, it is Dr. Plotkin’s own testimony and admissions which are now being used to change the minds lawmakers and state representatives to vote in favor of expanding religious exemptions to vaccination. Recently, the U.S. Department of Health and Human Services (HHS) replied to a notice requesting confirmation that certain obligations regarding vaccine safety the agency is tasked with have been fulfilled. Currently, both the HHS and CDC websites state “vaccines do not cause autism.” However, when asked in the notice for the studies that HHS relies upon to make such a claim, HHS failed to provide a single study to support its claim that none of the vaccines given to children by one year of age cause autism. HHS’s 2014 “comprehensive review” of vaccine safety even expressly stated it could not identify a single study to support that DTaP or Hepatitis B vaccines do not cause autism. Like Dr. Plotkin, HHS continues to contend that “vaccines do not cause autism” when its own “comprehensive review” and two scientific reviews issued by the Institute of Medicine concede the claim cannot be scientifically supported.